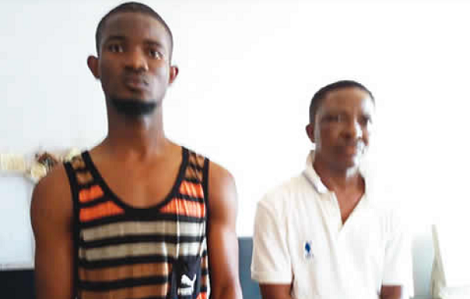 State Police Command have arrested the pastor in charge of Live By Faith Church, Ogbagu, in the Mbaitoli Local Government Area of the state, Ifeanyi Nwachukwu, for his alleged involvement in the kidnap of a one-year-old child, Damian Oluwa. Also arrested was a 23-year-old man, Miracle Emenekwuru, of Ifakala, in the Mbaitoli LGA. Briefing journalists on Thursday while handing over the rescued child to his mother, Vivian Ebere, the command’s Deputy Police Public Relations Officer, Ify Ezeudeogu, said the boy was kidnapped by a four-man gang on Saturday. According to Ezeudeogu, the hoodlums had invaded Ebere’s apartment at Egbu, Owerri, around 2am, and kidnapped the child after robbing his mother. She disclosed that the suspects collected Automated Teller Machine cards of the woman during the operation. The police deputy spokesperson said although N627,000 was paid as ransom for the boy, the suspects refused to release him to the family. She said “On Saturday, around 2am, a gang of armed robbers and kidnap suspects invaded the apartment of one Vivian Ebere. “The hoodlums robbed the victim and collected her ATM cards and eventually kidnapped her 17 months old baby, Damian Oluwa. According to Ezeudeogu, the police swung into action after a complaint was made by the family at the FSARS. “The FSARS operatives, acting on intelligence and constructive digital analysis, swooped on the assailants on Maduwuba Avenue, Orji, Owerri, arrested the two suspects and rescued the kidnapped child,” she added. The boy’s mother, Ebere, said after the family paid the initial ransom, the suspects demanded an extra N200,000. She said the five days her son stayed with the suspects were filled with nightmares for her household. “We have taken him to a hospital. A series of tests were run on him. He is okay now,” she added. The pastor told journalists that the victim was kept in his house, adding that he was not aware that he was kidnapped. He said when he queried the principal suspect, one Kechi Ogobuiro, who was at large, on how he came about the boy, he (Ogobuiro) lied to him. “He said he impregnated a woman who lived with her parents in Umuahia. He said his girlfriend handed over the boy to him,” he added. On the relationship between him and the principal suspect, the embattled pastor said Ogobuiro was the son of his child’s godmother. “He is a student at the Zenith University, Ghana,” he added.